Trans Canada train journeys conjure up notions of classic rail adventures. And this year we have significantly expanded our Trans Canada rail options to give travelers even more opportunity to enjoy this wonderful experience. 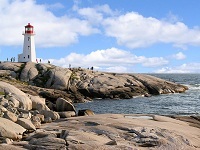 Package range in length from a compact 4 night, three day straight shot from Vancouver to Toronto or Toronto to Vancouver to a leisurely 17 day trip with two days on the Rocky Mountaineer and nights and days on the ViaRail Canadian in a private bedroom, stays at historic Fairmont hotels and resorts, and a concluding, or commencing, night in Halifax, Nova Scotia. In between there are 7, 12 and 16 night trips that combine the Canadian Rockies with train travel and big cities. The 12 and 16 day trips include two trains: the Rocky Mountaineer and The ViaRail Canadian. 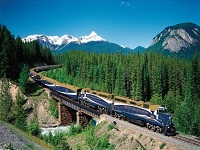 We have included seven Trans Canada train options. Some go between Vancouver and Toronto, others include Montreal and/or Quebec City. And some go all the way from Vancouver to Halifax, a journey of more than 6000 kilometers. These packages are available with starts in Vancouver, Toronto, Montreal or Halifax. If you prefer a custom Trans Canada train trip, Email, call 800-913-9207 or 604-990-9299 and we will put together a trip that’s just the right for you. Custom trips are never more expensive than the train packages you see here. This is the perfect trip for the train lover or the plane hater. Board the ViaRail Canadian in Vancouver any Tuesday, Friday or Sunday at 8:30 PM and arrive in Toronto four days later at 9:30 AM. Or board in Toronto any Tuesday, Thursday or Saturday at 10:00 PM and arrive in Vancouver four days later at 9:43 AM. 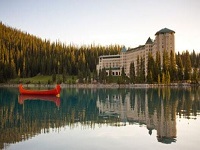 You’ll even have a 90 minute stop in Jasper, time for a micro exploration of the Canadian Rockies. Embark on this 12 day odyssey that includes two unique train journeys, the peaks, glaciers and emerald lakes of the Canadian Rockies. Stay in both Banff and Jasper National Parks, including a night the magnificent Chateau Lake Louise, before boarding ViaRail’s Silver & Blue Service between Jasper and Toronto. You’ll have three nights in a private bedroom on the train to Toronto and will round out your experience with a day trip to Niagara Falls.